Italy 1944... After a group of US troops witness an alien landing, they are quickly caught up in an adventure involving everything from Nazis to ray guns. 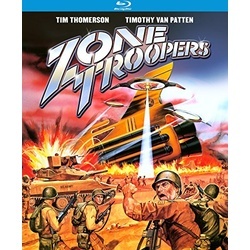 An outlandish blend of WWII combat and alien invaders from the producers of Ghoulies, Trancers and Re-Animator features Tim Thomerson (Cherry 2000) and Timothy Van Patten (Class of 1984) as two G.I. 's trapped behind enemy lines. Hitler's forces are rapidly approaching and all hope seems lost, until the Americans discover the wreckage of an alien spaceship with one its crew still alive. Danny Bilson (The Wrong Guys) made his directorial debut in this original science fiction adventure that co-stars Art LaFleur (Cobra).